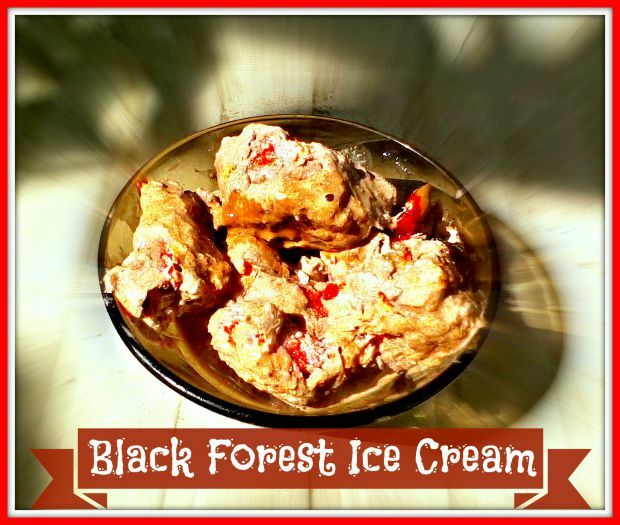 Delicious, not-so-healthy Black Forest Ice Cream. Perfect combination of sour cherry and dark chocolate! Only few ingredients and you don’t need an ice cream machine! Pit the cherries, blend it with a hand blender, strain it! Melt the dark chocolate. Pour the cooking cream to a freezable bowl and carefully add the sour cherry and the dark chocolate, I used a spoon. Put it into the freezer for 4-6 hours, stir a little about every 2 hours. In my case thecolors blended a little bit, but don’t worry, the tase will be worth everything!